‘The Adventures of Willamena Wombat’ is the first book in a trilogy that relates the adventures of four unique Australian animals lost in an English forest. 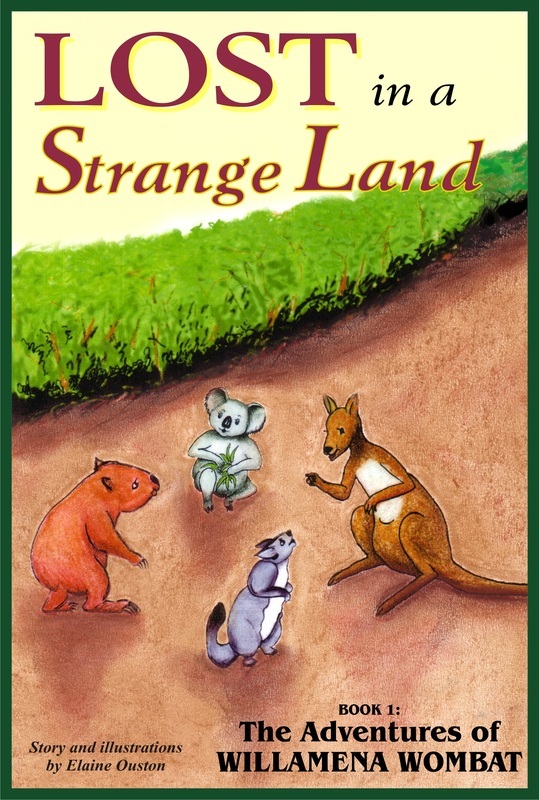 The stories cover the interaction between the unique animals of both countries, who, while very different, live in a similar manner. English forest. Searching for food in the dark forest, she detected the scent of an unfamiliar animal, and ran for her life with the animal in pursuit. There was no safe wombat burrow to hide in here. Willamena found herself at the mercy of a strange animal that came to her rescue. Can she trust this animal? How will she escape? Willamena Wombat cowered under the hedge, rolling herself into the smallest possible ball. The black shadow monsters threw their dark cloak over her and hid her from sight. She lay as still as a post, holding her breath, and softly whimpering in fear, as the big dog drew closer. ‘I wish I was at home in Australia now, safe in my enclosure at the Zoo with Wally. Why did they have to bring me to this place, it is cold and damp and scary,’ she thought. It all began on a bright summer’s day in an Australian Zoo. Kelly Kangaroo hopped up and down beside her enclosure fence restlessly. She was just two years old and was in an enclosure with many kangaroos. Even though she was average height for a young kangaroo, at just one metre tall, she was no match for the young males when she had to fight for food, and was often hungry after feeding time. She longed for the wide-open plains she remembered from her early days. She now lived in the Australian animals section of the zoo, between the koala and wombat enclosures, and over the pathway from the sugar glider. They were the only animals she saw on a daily basis. But sometimes a truck went by with exotic animals in cages and she longed to meet them. Such a truck had just past with a lion in a cage on the back. “I wish I could get out of here for a while. I’d like to meet the lion and all the other animals. I wouldn’t be afraid of them. I’m sure they’re friendly,” she thought. Willamena Wombat was in the enclosure next to her, and right at that moment, she couldn't believe her ears. The zookeepers were standing outside her fence, talking about sending her on a long journey to some place called England. She had just settled in her new home at the zoo, and became used the new young wombat, Wally, following her around, and now they were sending her to a place she had never heard of. Wally stood staring at her, his heart in turmoil, wondering how he would cope without Willamena. He had come to depend on her since his recent arrival at the zoo, and now she was being snatched away. Kelly heard Willamena muttering and hopped closer to the fence. “What are you muttering about Willamena?” she asked. Willamena repeated the story to Kelly. Kelly jumped in fright. She often watched the planes fly overhead and thought how scary it would be to be so far off the ground. “It could be fun ... except for the plane ride,” she said. “I wish I could come too,” she added as she hopped off to check the reason for the commotion outside her enclosure. “But, I’ll miss you,” Wally said, his heart heavy with sadness. Willamena smiled fondly at him and replied, “Yes, I’ll miss you too.” She had suddenly realised that even though she had thought he was a pest at first, she really would miss him. “How do you know?” Willamena asked her eyes wide in amazement. “I just heard the keepers talking about it, I'm being sent to that place... and that's not all... Katie Koala and Penny Possum are coming too!” Kelly was so excited she could hardly get the words out. Willamena brightened at once. They were all going. ‘Maybe it won't be so bad after all,’ she thought. Wally gazed at her wistfully. “I wish I could come.” Willamena patted his arm to console him. In the koala enclosure, Katie clung to the tree trunk, stunned at the news. She reached out her long furry arms and hugged her baby, Christian, tight against her short body. His large fluffy ears tickled her nose as he snuggled into her chest. He was over a year old now, old enough to take care of himself; but she still didn’t want to leave him. “Maybe if I’m more aggressive towards the handlers they’ll change their minds,” she muttered. So when her keeper, Dave, came to show her to the crowd, she grunted and growled at him. He stepped backwards in surprise. “What’s up Katie, are you not well?” he asked, his voice soft with concern. Katie bowed her head in shame and reached out her arms. She just couldn’t do it. Dave had always been kind and gentle with her and she couldn’t be nasty to him. ‘Maybe it won’t be so bad,’ she thought, trying to push the image of leaving Christian to the back of her mind. Penny Possum lived in the cage across from Kelly, and she was just as overjoyed to be leaving as Kelly was. She climbed swiftly up the bars at the front of her cage, chattering excitedly. She stretched her small, twenty centimetre long body, and fluffy tail (which was about the same length as her body) across the bars as she tried to catch Kelly’s attention. The extra skin that enables Penny to glide stretches from the fifth finger of the front claw back to the first toe of the hind foot. Stretched out, it made her look almost as a wide as she is long. The strong contrast of her white chest, against the grey fur on the rest of her body, made her stand out like a flag on a pole against the darkness of her cage. Over the next few weeks, Kelly and Penny spent lots of time chattering excitedly to each other about their trip. The weeks passed swiftly and finally their departure day came. Willamena and Katie had tears of sadness and fear in their eyes as they were taken from their enclosures, but Kelly and Penny rushed excitedly into their travel cages. “Can you believe it Penny; we’re going to a new country?” Kelly said, hopping about in her cage. “It’s awesome, I can’t wait,” agreed Penny, “but I'm not sure about the plane ride,” she added in a worried tone, running nervously from one side of her cage to the other. “If you two don't be still, you’ll knock over your cages and hurt yourself,” Willamena called. Katie groaned. “I do hope they settle down or this journey will be very tiresome.” Glancing back into her enclosure, she spied Christian watching. Her heart was heavy with sadness at leaving him. She wished he was coming with her. When she said goodbye he had stared at her without any emotion showing, but she had seen the damp tracks his silent tears made in the fur on his face. She knew he was as upset as she was about the separation, and she longed to rush back and hug him one more time. Wally refused to come out to see Willamena leave, but she understood it was too painful for him. He had clung to her when she said goodbye in the burrow earlier. He growled and fought the keeper, who had to pull him away. The keeper patted him reassuringly but he just scurried into the burrow and hid. Willamena and Katie bowed their heads in sadness as the truck drove them to the airport, but excitement, mixed with a little fear, coursed through them, as they were loaded onto the plane. They tried to settle down and enjoy the flight, but the strange noises and movement of the plane made it hard to sleep. The plane ride became long and tiring, and the animals fidgeted in their cages. Dave didn't know how true his last words were to be.